This year's ornament truly represents the spirit of the Sunshine State. Gleaming, with a mix of matte and high gloss finishes, the Florida sunshine reflects strongly off this beautiful holiday addition to your Christmas tree. Along the inside of the state line work maps the famous waterways include well known landmarks like Lake Okeechobee. 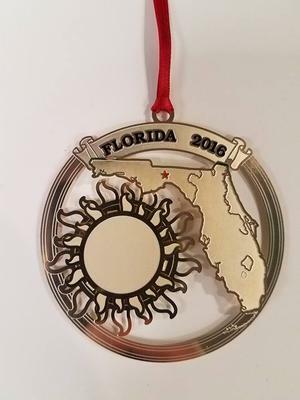 Made in the USA, this ornament is the perfect representation of the state and would be an amazing gift for any Florida fan!